Oh hi, June! It’s lovely to see you. Except everyone is talking about how Mercury is in retrograde, which essentially means that things are getting WEIRD and ANNOYING around here. Now, I’m not usually one to buy what the stars are selling me, but I’m having trouble shrugging this one off, mainly because of all of the WEIRD and ANNOYING stuff that the universe seems to be throwing my way. I won’t harp on most of it because nothing is really all that consequential – in fact, I was ready to give Mercury the benefit of the doubt and send it on its merry (if retrograded) way – but then my freezer up and stopped working for a hot sec (except it was many hot seconds, hours even), thawing everything in it to a nice, soupy mush, for no apparent reason whatsoever. BAH! Mercury, you salty asshat. Normally I’d take solace for this annoyance in a pint of ice cream, but that doesn’t seem to be an option just now. (#IceCreamSoup). On the bright side, I’m eating more salad. I made this simple chopped salad last week, while I was home in Philly to see my fam and sell some books on QVC (…because that actually happened. I mean, WHAT?!). It’s perfect for these warmer days, when you don’t feel like spending much time in the kitchen, but want some healthful, flavorful options on hand. Plus, salad for dinner makes a better case for hitting up Molly Moon’s for dessert. So beat it, Mercury. I love the mix of cool crunch, salty tang and sweetness in this easily thrown-together salad. Serve it alone (and maybe add some chick peas for heft), or pair it with some grilled chicken and cool tzatziki for a knock-out dinnertime combo. 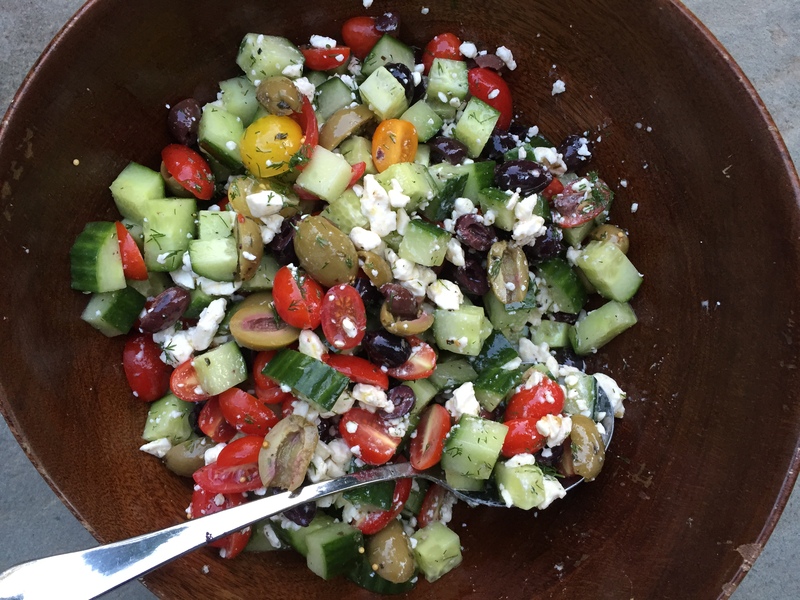 In a large bowl, combine the cucumbers, tomatoes, olives and dill. Drizzle the olive oil and vinegar over the salad, and sprinkle with salt and pepper. Toss to combine, and taste for seasoning. 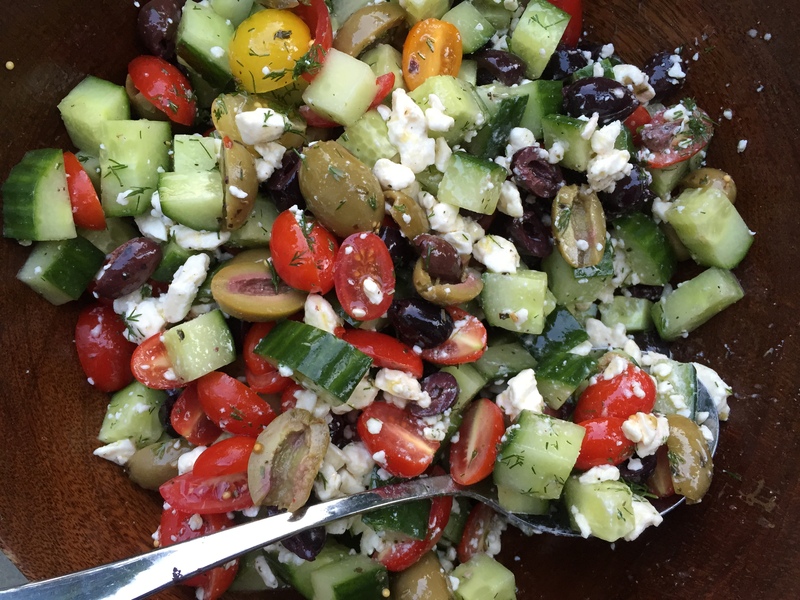 If you’re serving the salad right away, add the feta and toss. 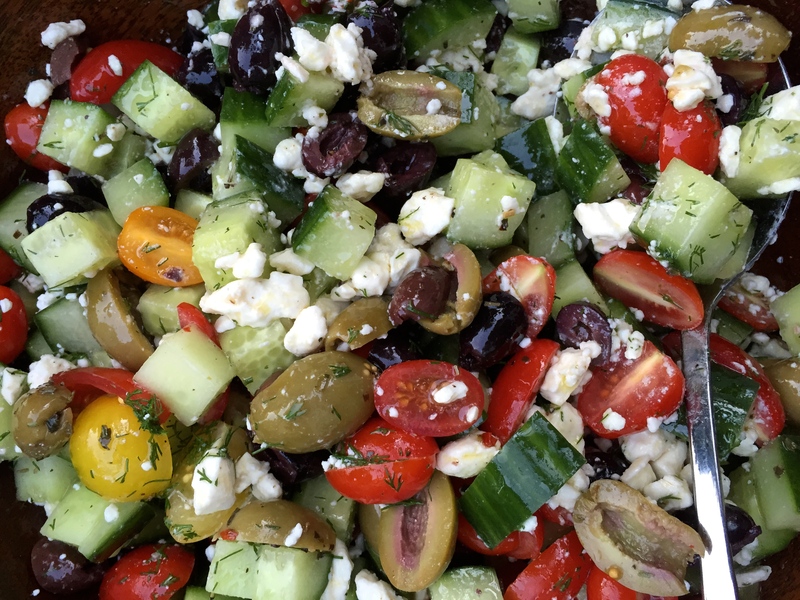 If you want to make it ahead, cover and store in the refrigerator, then toss with feta immediately before serving. did they seriously sell 7000 books in 10 minutes?? also. you are hilarious. that is all.